This awesome stainless steel lunchbox by Mintie, bought on Amazon for £22. If that sounds a bit steep, remember that this is a very sturdy product which should last many years and obviate the need for plastic boxes and bags. It’s too small for something like an apple or a banana, so it comes with a cloth drawstring bag. The little pot is so handy for hummus and soya yoghurt. 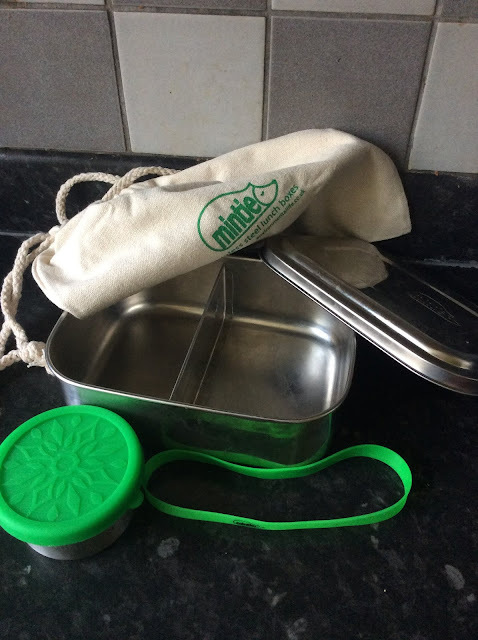 The pot's lid is silicone and leakproof, and the silicone band for the outside of the box means you can slot in a small piece of cutlery without having to worry about taking up space inside. I especially love the fact the box is divided into two compartments: no more soggy crackers! These two flours are from our local Indian grocery and are the new staples in our gluten-free baking repertoire. 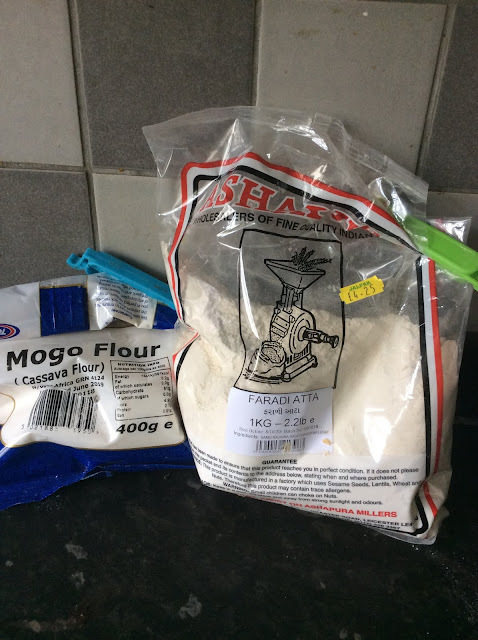 On the left, mogo flour (made from cassava) is a superb choice for cookies or tortilla-style flatbread- I'm working on a flatbread recipe now and the first version was very promising. We can't wait to see how it performs in cakes. The second, faradi atta, is a great gluten-free flour made from millet and chestnut. Find our chapatti recipe here. We also add it to pancake batter, cakes and dumpling dough. 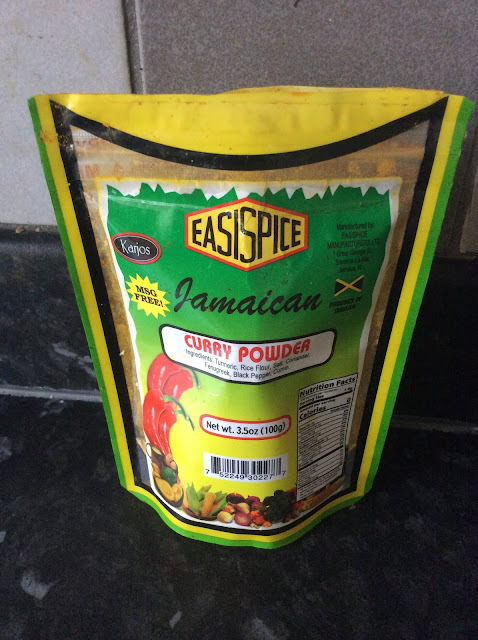 Found in a Caribbean corner shop, this spice mix is fabulous! We often struggle to find mixes that don't contain dried onions or garlic (we don't cook with either of those) but this ticks all the boxes. It has a lovely yellow ochre colour, and the heat comes from pepper rather than chilli. It makes a curry quite different from Asian curries and I've been making bean and veg curry with coconut rice'n'peas and cornmeal dumplings regularly. Sadly the packet is now empty but we've kept it so we can find another or, failing that, replicate the mix using the ingredients list. If you zoom in, you can just about see it contains turmeric, rice flour, salt, coriander, fenugreek, black pepper and cumin. We love to enjoy fruits of our gardening and cooking labours! Our homegrown tomatoes this year were packed with flavour and sunshine. We had so many we dried a large batch in the dehydrator and made three jars of “sun dried” tomatoes in olive oil. This is all we have left now, and it’s gone into hiding until Christmas. 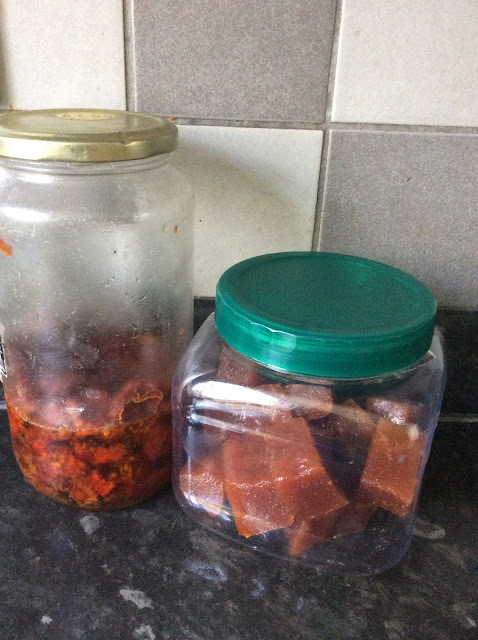 Also in hiding until Christmas is the membrillo we’ve posted about here. Can’t wait to see how it pairs with our home made smoked paprika cashew cheese!